Take a classic club sandwich, add peanut butter and some other creativity, and voilà: a new classic. CAPSULE REPORT: This is the fourth of six award-winning, delicious and nutritious recipes developed by children in Jif’s annual “Most Creative Peanut Butter Sandwich” college scholarship contest. Click on the black links below to see the other recipes. For more peanut butter recipes and product reviews, visit our Gourmet Peanut Butter Section. The youngest winner of the bunch, 9-year-old Charlie Fitzpatrick, from Hillsborough, North Carolina, created a special twist on the classic turkey club by incorporating peanut butter, maple syrup and spinach. This creative combination is served toasted for a warm, melty treat. Arrange bacon slices on foil-lined baking sheet. Drizzle each slice with maple syrup. Using fingers, spread syrup to coat each slice evenly. Bake 15 minutes or until nicely browned and slightly crisp. Remove from oven to cool. Toast bread slices. Slice chilled apple thinly. Spread each slice of bread evenly with 1 tablespoon creamy peanut butter, on one slide only. Arrange bread, peanut butter side up, on clean work surface. Lay half of the apple slices on one of the slices of white bread. Next layer half of the turkey breast. Arrange half of bacon slices on top of that. Lay three of the spinach leaves last. Place the slice of whole wheat bread, peanut butter side up, on top of these ingredients. Repeat the layering and arrangement of the remaining apple, turkey, bacon and spinach on the slice of white bread. Finally, place last piece of bread peanut butter side down to complete sandwich. Carefully, holding sandwich firmly and pressing down slightly to compress, use serrated knife and trim all edges. Delicately, cut the sandwich on the diagonal to form four small triangles. Push a frilled toothpick into the center of each of the triangles. 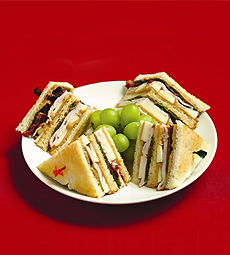 Place each triangle on its side so the sandwich layers are visible, leaving space in the center of the plate. Fill space with grapes, potato chips or other favorite accompaniment.